QUIET, an experiment searching for an elusive signal of inflation in the very early Universe, recently released a new measurement of the polarization of the Cosmic Microwave Background. Mere fractions of a second after the big bang, the Universe is hypothesized to have undergone an inflationary era where space expanded faster than the speed of light. ''Inflation'' predicts that gravitational waves of order the size of the Universe would have been created during this era. If correct, these gravity waves would have left a faint signature on the CMB - the first light from the early universe - that would still be present today, nearly 14 billion years later. And if inflation was driven by physics at the Grand Unification Scale of Particle Physics (as many theories suggest), those gravity waves should be detectible. QUIET is designed to search for these faint signals - polarization patterns in the CMB. It has long been recognized that this is one of the most important topics in observational cosmology, providing access to physics unable to be reached by any other means. The best information on CMB polarization currently comes from experiments operating at the South Pole. The Atacama desert in Chile, from which QUIET operates, is another attractive site. At nearly 17,000 ft (above almost half the atmosphere), the site provides excellent conditions for CMB observations. The combination of altitude and dry conditions means that there is very little water vapor, vital since it interferes with microwave signals. There are 2 other experiments slated to go to the Atacama desert and look for the inflation signal in CMB polarization; these are POLARBEAR (led by Berkeley), and ABS (led by Princeton). At Chicago we are coordinating this group of 3 experiments, in particular so that they observe the same patches of sky. QUIET is the first of the 3 to have taken data. QUIET deployed two detector arrays between October 2008 and December 2010 during which over 10,000 hours of data were collected. The first season of data (3458 hours) was collected with a 19-element array. In July 2009, this receiver was replaced with a 90-element array, observing at a shorter wavelength. Its operations are also ending this week. The results reported this week are from the first season of data. One of the unique aspects of QUIET is its use of coherent correlation polarimeters (see figure 2), in contrast to the bolometric detectors that almost all other experiments use. This technique was enabled through a breakthrough achieved at JPL in the miniaturization of these polarimeters (''radiometer on a chip'') which allows their mass production. 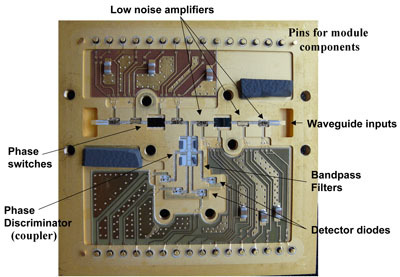 Figure 2: Inside a QUIET 43GHz detector. Each detector is only 2x2 inches in size. The polarization in the CMB can be divided into two patterns on the sky - known as ''E modes'' and ''B modes.'' E modes, first detected by DASI, have by now been observed by many experiments; they are a firm prediction of our standard cosmological model. Figure 3: Maps of the polarization of the CMB. The colors show the strength of the polarization signals in one patch of the sky that is roughly 15ox15o in size. They were made with the 19-element QUIET receiver. We expect a strong signal in the E modes from the standard model. The fluctuations in the B mode plot are only noise, showing that any signal from gravity waves must be smaller than we can detect so far. Figure 3 shows QUIET maps of both the E and B modes. The signal for the E-modes is quite clear while the B-mode map is consistent with pure noise. B modes are a signal of gravity waves so the lack of a signal there leads to the placing of an upper limit on the possible level of gravity waves. 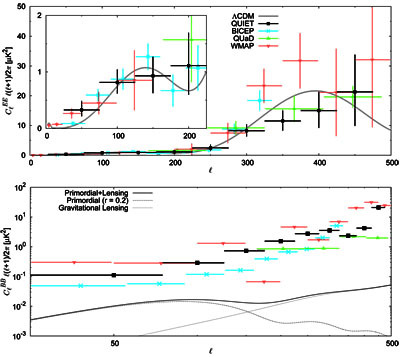 Figure 4: QUIET's first measurements of the polarization of the CMB along with other measurements by the WMAP satellite and ground-based experiments BICEP and QUaD. Top: E-Mode power spectra. Bottom: B-mode power spectra. (The dashed line shows a possible signal from gravity waves, the dotted line shows contributions from gravitational lensing). Figure 4 shows the results of the analysis of the QUIET maps, leading to what are called ''power spectra,'' along with comparisons with other experiments (in each of which KICP had roles). Observing for a shorter time than each of the other 3 experiments, QUIET still has good detections of power in E-modes and sets competitive limits on the B-mode spectrum. While none of the B-mode experiments has a limit better than what is known from other probes (the solid line in the bottom panel of figure 4), B- mode experiments will be the best way to give us more knowledge on the existence of these gravity waves. (4) the B-mode signal is so small that one has to consider a variety of systematic effects that will lead to ''false power.'' QUIET has demonstrated the best immunity to such contaminants compared to any other published experiment. The group will turn now to the analysis of the data from the second receiver. There are efforts at improving the sensitivity of our detectors as well. Thus the future looks bright! We mention also that the SPT collaboration will be equipping their instrument with a polarization sensitive array and begin data taking about a year from now. Our collaborators in QUIET are from the California Institute of Technology, Columbia University, Fermi National Accelerator Laboratory (Fermilab), the High Energy Accelerator Research Organization (KEK), the Jet Propulsion Laboratory, the University of Manchester, the Max- Planck-Institut fur Radioastronomie, the University of Miami, the University of Michigan, the University of Oslo, the University of Oxford, Princeton University and Stanford University.